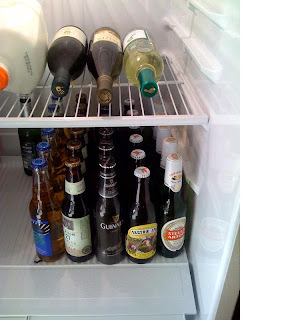 Hi ho, hi ho, it's off to the fridge we go...just as I was getting ready to blow the whistle on another long work week and head to the fridge for my four o'clock beer, I got an e-mail from Mary Alice, one of our dearest friends who left the Roxiticus Valley and moved out to sunny Palos Verdes, California before the school year started. We miss her and her family terribly, but they seem to be enjoying their new home on the left coast. Turns out that Mary Alice and her husband have decided to remodel their refrigerator in California to look a lot like Roxy's! Mary Alice gave up her career, at least for the time being, to follow her husband to his new job and location in Califonia, and she's still trying to get used to being a stay at home mom. I'm trying to convince her to add a Roxy's Best Of... Palos Verdes and Roxy's Best Of... Orange County and Roxy's Best Of... Laguna Beach to her list of responsibilities, but she's not ready. She procrastinates, putting me off with questions about the Roxy's Best Of... healthcare plan and other employee benefits. If Mary Alice needs a health care package from Kaiser Permanente California, I may as well look into benefits for my other local bloggers....if Rex's son moves out to Denver or Boulder to work in sports marketing and blog for me on the side, he will be looking for a plan from Kaiser Permanente Colorado and it won't be long before I need one from Kaiser Permanente Georgia for Atlanta Roxy bloggers. 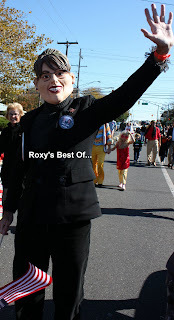 So you're safe for now, Mary Alice.... raise a glass (or a bottle) from your newly remodeled refrigerator, and enjoy those play dates while you can, because it won't be long before Roxy's Best Of... comes to a local area near you! 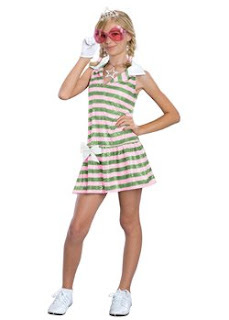 Here's the reason we won't make it down to our beach house in Bay Head until Saturday morning... Rex, London, Maddie and I are going to an old-fashioned sock hop featuring the Alley Cats at Mendham Township Elementary School tonight. The Mendham Township School District's Cultural Arts Committee invites families to a fun night of 50's music, dancing, and contests. So... put on your poodle skirts, roll up your jeans and join London, Maddie, Rex and Roxy at the Family Sock Hop tonight -- Friday, October 3rd from 7 to 9pm in the Mendham Township Elementary School gym. 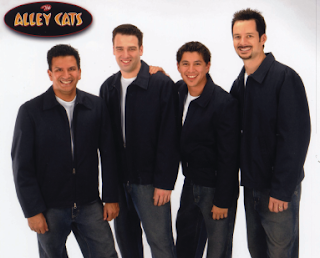 The Alley Cats will provide the musical entertainment. $1.00 ice cream sodas and other refreshments will be served by the 8th grade fundraising team. 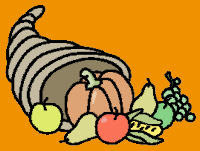 Please bring donations for the Morris County Food Bank. Just kidding...with my birthday on its way later this month, I'm well aware that I am all grown up. After a day on the phone with a difficult client and the miserable stock market making me sick to my sensitive stomach, though, I was starting to wonder if investment banking is the right career for me. I found a web site that matches people with the right franchise and started to play around with other opportunities for when I really really grow up...or maybe in my next life, since the gray hairs are really coming in this week. I considered automotive repair franchises...not for me. I even dread the conversation with the mechanic at Jim Salerno Automotive when my SUV starts to make a clunkety clunkety sound or the ride just doesn't feel right. How about a blinds franchise... I could call it "The Blind Leading the Blind." Maybe a Moving Franchise is right for me... as long as I don't have to do all the heavy lifting. I still remember the 48 hours when The Padded Wagon spent about 18 hours moving all of our belongings out of New York City, and then I surprised them by opening the door at my Somerset, New Jersey, house the very next day so they could consolidate all of those belongings from my single days into our lovely home in the Roxiticus Valley. The fact is, for all my frustration on the bad days, I really love being an investment banker, helping people to sell their companies to the highest bidder. Since Rex and I focus on mergers and acquisitions, I don't really spend my day up to my neck in the stock market, and we get to know a nice circle of entrepreneurs. So I'm going to stick with investment banking, until I figure out how to make a living blogging from my boudoir. 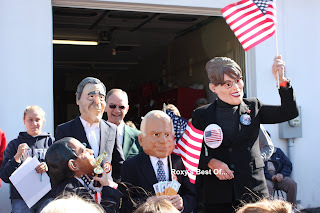 Countdown to the Bay Head Halloween Parade...London and Maddie, Rex and Roxy Are Almost Ready! Last year, we competed as a family...sort of. While you may be familiar with two Disney characters -- Hannah Montana and Sleeping Beauty (Aurora) -- you may not be aware that they were sisters. London wanted to dress up as Hannah Montana, but Maddie had a theme picked out for our family...Maddie as Sleeping Beauty, Rex as her handsome prince, and Roxy as Maleficent, the thirteenth fairy who was not invited to princess Aurora's christening. When Maddie saw her sister's costume, she coveted the blonde wig and microphone and had to have one of her own, and the legend was born: Aurora Montana! 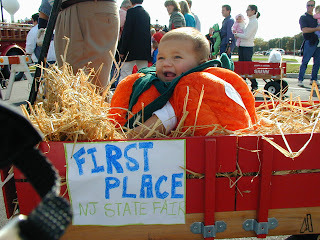 The panel of judges smiled upon us and we won a family trophy in the Bay Head Halloween parade last year. 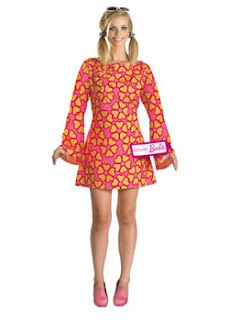 Today, I bought our family's Halloween costumes online...the girls convinced me to be Barbie, and Rex will be Ken, in our coordinating outfits from the Sixties. 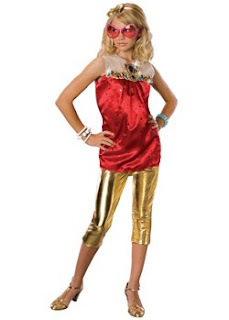 We'll be rocking the parade route with not one but two Sharpays from High School Musical: Sharpay Golf and Sharpay End of the Year in gold hot pants. Do you think we've got a shot at a trophy this year? I think I'm going to shut down my Google sidebar so I can't see how the stock market is doing anymore. I thought when the House passed the bailout bill, stocks would bounce back a bit before the weekend, but no such luck. So I've stopped looking at it and I'm doing my bit to help the economy by shopping online. I bought our family's Halloween costumes this afternoon, and now I'm checking out designer clothing online... brands like Loeffler Randall and Madison Marcus. Gotta run...Maddie's afternoon play date is here. Time for my four o'clock beer (let's make it a Weyerbacher Imperial Pumpkin Ale). Then, as Hannah Montana would sing, I'll be ready to put on my old blue jeans and head out to the Family Sock Hop at Mendham Township Elementary School. See you at the beach tomorrow! While there are a lot of events in the Roxiticus Valley this weekend competing for our time and attention, wild horses can't drag Rex, London, Maddie and me away from our beach house in Bay Head, New Jersey, on what the weathermen are forecasting to be a perfect October weekend. 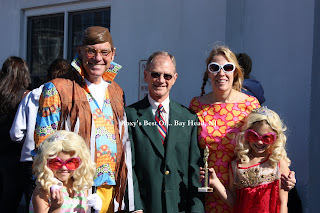 70 degrees and sunny on the beach means it is time to grab the last of the Indian summer and hope to see all of our beach buddies one last time before we close up our house for the winter after the Bay Head Halloween Parade on Sunday, October 26th. 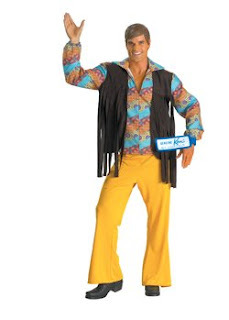 I bought our family's Halloween costumes online today, so we'll all be ready to compete for a trophy this year! On Sunday, when we head back, we're also planning to pack up the Mermaid Swim Team, the Mermaid Cocktail Party and our Kate Leigh Cutler painting so that we can enjoy them in our Mendham home over the winter. It's fun to share them with our friends up north who don't get to visit us while we're at the beach all summer. Tonight, we're off to the Family Sock Hop at Mendham Township Elementary School...but we'll try to get down in time for a Central Market sub for lunch...see you tomorrow! What Do Kids Do These Days Instead of Prank Phone Calls? Things have changed a lot since I was a kid. I remember getting all the girls together for a slumber party and calling all of my fourth grade crushes on the phone. We'd ask them if their refrigerator was running, or sing the jingle for Enjoli perfume: "I can bring home the bacon, fry it up in a pan, but never ever let you forget you're a man, cuz I'm a woman..." Nowadays, CallerID and other modern-day technology give prank call victims all sorts of Phone Number Info so your identity is no secret. If you're a kid, let me know what kind of trouble you get into these days instead of prank calling. If you're looking for something to do that day, why not consider the Bay Head Historical Society House Tour, and snoop around our neighbors' houses from 11am to 3pm. I'm sure I'll be sorry to have missed the annual Bay Head Dog Walk, also scheduled for October 11th, but I'm sure the dogs will leave something on my lawn to remind me that they stopped by our beach house. You can register your sweet pups in front of Mary Holder Realty, 520 Main Avenue, at 12:30pm, and the walk starts at 1:00 PM. There's a registration fee, but proceeds go to a good cause, the local animal shelter. During the month of October, you can also see the display of scarecrows around town and vote for your favorite by dropping your ballot in the boxes you'll find in designated stores. Calling Lady Java... Can I Get a Pumpkin Spice Latte Over Here? Did you ever wish there was a National Phone Book? Every now and then, particularly when I'm burning the midnight oil in the blogosphere, I get the urge to pick up the phone and track down Lady Java or Mariuca, but I guess I'd need an international directory for my blogosphere buddies halfway across the world. Anyway, for simpler tasks there's a new site that allows users to search for information on any phone number, both listed and unlisted, in the U.S. That can really come in handy for finding phone numbers to set up London and Maddie's play dates with new friends. It's that time of year in Bay Head, New Jersey...time to snoop into the neighbors' homes during the Bay Head Historical Society House Tour. This year, it is scheduled for Saturday, October 11th from 11am to 3pm. For more information call 732-892-0223. Rex and I love to participate in these events, and we'll usually bring along his mom and get a teenage babysitter to keep London and Maddie entertained...last year, the Bay Head School Foundation hosted a kitchen tour, with a taste of more than ten local area restaurants served up in Bay Head and Mantoloking kitchens. This year, we'll miss the Bay Head Historical Society House Tour, since we're headed away to Duck, North Carolina for a long weekend. Why don't you go and tell us all about it?